On a broken-down pier in Santa Monica, Frank Graves is shot and left for dead. But six slugs in the chest and a dip in the Pacific Ocean are only minor inconveniences when you're a "zombie with an attitude." Now Frank's back, and he's ready to end the double-crossing once and for all. At first glance, Grave Danger looks like a sure-fire hit: Jim Bryant's idea for a zombie noir tale is clever and Dave Fox's "Sin City"-style artwork fits the story perfectly. After a couple of pages, though, the short novel loses its shine. How could something with this much potential fizzle out so quickly? Answer: poor writing and awful editing. A few proofreading oversights are acceptable in most books. But in Grave Danger, the errors are a constant distraction: There are so many mistakes that spotting them becomes more fun than reading the story. Characters "peak" when they should "peek"; a phone dangles from its "chord." Twice, the author uses the word "out" when he means "at," resulting in odd action scenes: "He flew out me, and I flew at him." To make matters worse, repetitive word usage plagues sentences like, "I tipped the bullet over and neon green powder poured out of the tip." What truly cripples the novel, however, is its logic - or lack thereof. Zombies exist in Grave Danger - that's understood. But would a beautiful woman actually kiss - and then fall into bed with - a walking corpse that has been dead for over forty years? Let's talk about Frank's buddy, Nick. He lives in a dive called The Sandman Motel, yet his closet is a veritable armory: "Machetes! Grenades! Handguns! Rifles! Machine guns! You name it, and it was in his closet." Wouldn't such a well-stocked motel room be the target of every low-life thief in the neighborhood? The questions just keep coming. Frank's former commanding officer is described as a "brilliant scientist, but an even more brilliant assassin." Would a "brilliant" hitman hire a waitress from a diner to betray and destroy his enemy? And would a pair of none-too-bright LAPD detectives - guys who sit around and debate whether Chuck Norris or Bruce Lee would win in a fight - really be able to get their hands on a hardcopy file detailing Frank's involvement with the CIA during the Cold War? 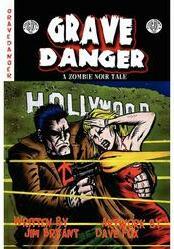 Luckily, Grave Danger is a fast read. Other than Dave Fox's illustrations, that's the best thing about it. So why do five reviewers at Amazon award the novel five stars? Who are these people? Let's see: "Flynn" loves the book, and "Tiki Pete" recommends it, too. Strange: Errol Flynn is mentioned several times in the story, and Tiki Pete's is a hole-in-the-wall bar where Frank hangs out. Interesting coincidences. If you still haven't gotten the message, listen up: Steer clear of Grave Danger. Great concept, great visuals; terrible book. Maybe the movie will be better: Jim Bryant says his original screenplay has been optioned by an independent production company.